Family owned for three generations, Barth Electric boasts such high profile clients as Lucas Oil Stadium, the Indy Motor Speedway Tower, and the Conrad Hilton Hotel. Photo courtesy of Barth Electric. For small fleets, safety is much more than lower insurance premiums and fewer vehicle repairs. As small businesses are staples of their communities, acting responsibly on the road translates into good public relations and potential contracts. 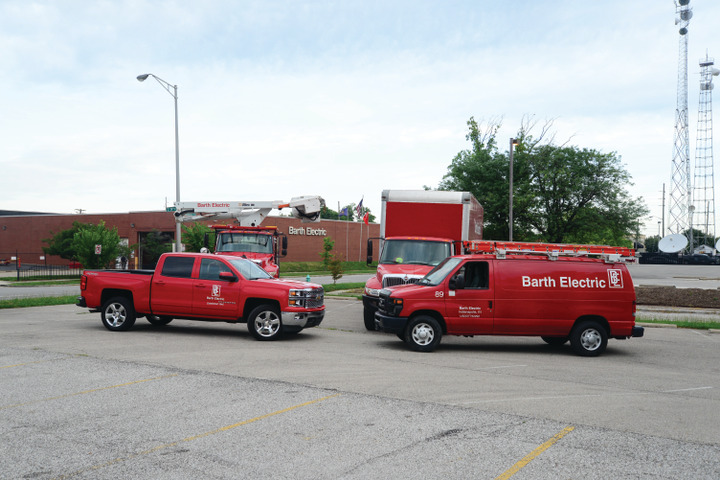 The scope of safe driving isn’t lost on Barth Electric, a mid-size electric company that’s been serving greater Indianapolis for almost 75 years. While the company has always had safety practices in place, Barth wanted to take it one step further, partnering with GPS Insight to implement a telematics system to monitor its fleet. “We had been knocking that idea around for some time and we had read about other companies that experienced better safety, lower incident rates, [and] fuel savings,” says Eric Watts, labor superintendent and safety director at Barth. Family owned for three generations, Barth Electric boasts such high profile clients as Lucas Oil Stadium, the Indy Motor Speedway Tower, and the Conrad Hilton Hotel. With a fleet of 47 telematics-equipped vehicles and about 170 electricians, Watts says that the data collected helps management identify common unsafe practices, better manage fueling practices, and help lower the company’s insurance premium. Since installing the telematics devices almost a year ago, Watts says drivers have become more aware and conscious about their driving habits, and how those habits reflect the company. With billboards on the sides of their trucks and vans, unsafe driving practices such as speeding, running red lights, or hard braking can reflect poorly on the company. “Any time you can reduce that, you improve your public image,” Watts says. The GPS Insight system allows Watts to identify and track “safety events,” which have decreased 52% for light- and heavy-duty vehicles over a period of three quarters. Watts worked closely with GPS Insight and Amerisure to identify the relevant metrics to build the safety scorecard, which were subsequently fine-tuned. Watts set the system to give drivers an in-cab alert if they exceed predetermined speed limits: 75 mph in vans and 65 mph in larger trucks. Driving 10 mph over the speed limit results in an email to drivers for each incident. Watts also measures hard braking and cornering, which deliver in-cab alerts as well. Watts collates driver data into color-coded bar graphs, and then conducts one-on-one meetings to show drivers’ performances in relation to their peers. Barth’s electricians have even taken the step to make suggestions as to what tools will help them practice safer driving. After the system identified numerous speeding incidents on longer routes, drivers requested cruise control, so the company added an aftermarket system to vehicles covering those routes. “We did see their speeding alerts come way down after that,” Watts says. By getting drivers involved in the telematics discussion, they become partners with management in ensuring safe driving practices, Watts says. Barth Electric intends to start incentivizing and rewarding drivers who have the fewest incidents per month, though better driving has already ensued after gathering and sharing the data.